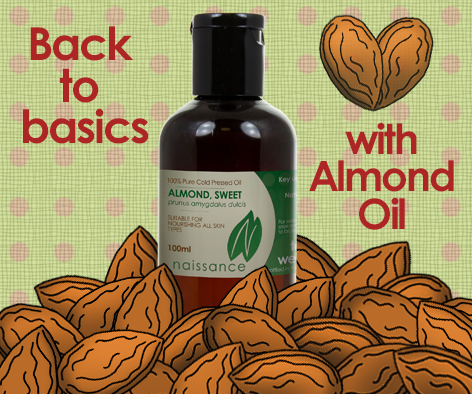 As there are so many different carrier oils available on our site, sometimes it’s nice to get back to basics, so we thought we would write about our love for almond oil. This oil is versatile, beautifully simple, extremely nourishing and enriched with vitamins A, B1, B2, B6 and Vitamin E. These are some of the reasons why it is one of the most popular oils used in aromatherapy, massage and to make your own beauty products. There are plenty of ways you can use almond oil as a part of your daily routine or lifestyle and using it as part of your daily skincare routine will help to protect your skin from damaging free radicals and keep your skin healthy and fresh looking. To celebrate the humble little Almond that we adore, we have included a little DIY recipe using Almond oil. This is the perfect little homemade treat for the summer to brighten, buff and polish your beautiful body. Simply pop the Dead Sea salts in your chosen container and then add your Almond oil and essential oil (if using essential oil) and mix together. Take a shower or bath and apply your homemade scrub to wet skin, concentrating on those ruff or dry areas. This will help to lock the moisturising properties of the oil into your skin. You can then rinse off and continue with your regular shower or bath routine.